Precise off-beats arrangement, allows following tempo nuances carefully. New bar metronome feature makes possible to follow rhythm by ear. Newest automated transcription algorithms, including drum detection feature. Real-time recognition module and Composition Analysis tool. Recognition Wizard guiding the procedure of music transcription. Batch convert tool for transcribing multiple files with one click. Language Manager capable of switching between languages (Windows only). WIDI Professional additionally includes unique TrueTone Editor for correction of transcription result. 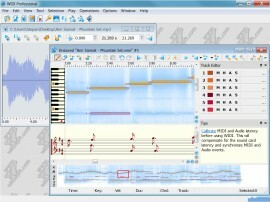 Piano roll MIDI editor with visual comparison of audio spectra to MIDI notes. Notes can be viewed as score while editing with Score Viewer. Bar arrangement is done manually or by tapping strong beats. MIDI playback or recording synchronously to Audio playback. Many other features specially designed for computer assisted transcription. Get scores from audio musical recordings for printing or performing. 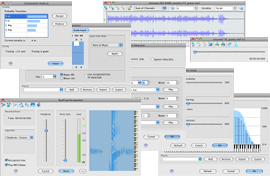 Create new arrangements for recorded music, change musical instruments and extract musical lines. Perform transcription on the fly, controlling a synthesizer with "analog" instrument or singing. Analyze tonality and tuning of any audio musical record or MIDI piece. Create exclusive MIDI ringtones for your mobile phone. Download free trial now and try it yourself! Try WIDI Recognition System for free - the best WAVE to MIDI, MP3 to MIDI, CD to MIDI and Audio to MIDI converter for windows and Mac OS X.